In the past year we’ve gathered quite a library of children’s books that we like to read to Liam but we’re especially fond of the Sandra Boynton board books. 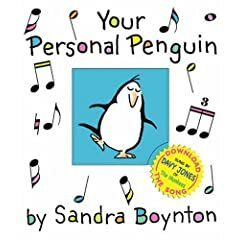 One of her books, "Your Personal Penguin" has a companion song that’s sung by none other than my favorite Monkee, Davy Jones! Davy is featured in the book and on the CD, singing the title song. Reportedly, Davy & Boyton have become close friends as a result of the project. Visit Workman Publishing to see other behind-the-scenes videos and listen to more Boynton songs. Rob thinks Opus would approve!